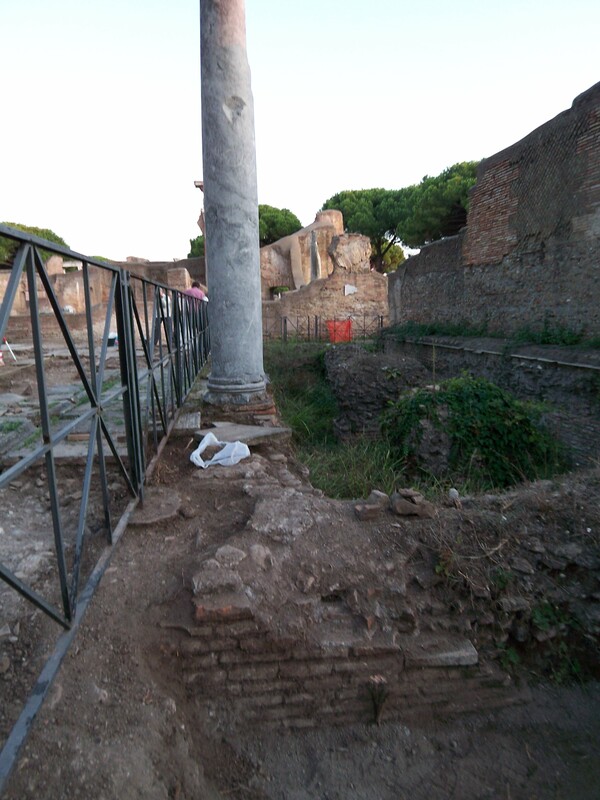 It has not been possible to dig on the Foro della Statua Eroica, without being constantly reminded of the adjacent forum baths, looming over the south side of the plaza. We also know that our forum was in fact constructed on top of a smaller set of baths, that was perhaps linked to, or perhaps separate from, the forum baths to the south. The apsed walls of this structure poke through our paving in many places, and were everywhere demolished to make the flat level on which our forum was constructed. But an open question is the role of the large Late Roman cistern found on the west side of the plaza – was this constructed in order to provide a reserve for the baths, using rainwater from the portico roof? – yes probably, as the aqueducts of Ostia are known not to have worked well in Late Antiquity. However, today a second possible cistern was uncovered, as two huge parallels walls were exposed by surface cleaning, and suddenly the back piers of the façade area looked credible as vault supports for the roof of the intervening space. They include reused material so it is likely we have here a second Late Roman cistern. But this great space was filled in and covered over with mortar at a later date, a different mortar from that found on top of the walls. It seems that we have here in fact the same two phases are we had in the area of preserved paving on the opposite side of the plaza. 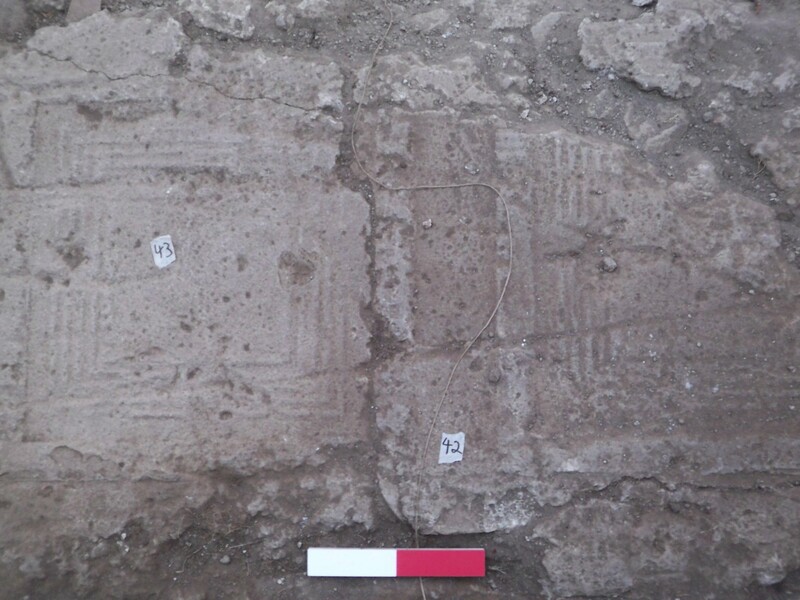 Just like on the far side, we have here a first level of mortar with the reverse imprint of re-used slabs, including large inscriptions, which have later been removed, and then a second layer of mortar put down. We need to clean more, but it looks like the 4th c. plaza had many cisterns and this was reduced to only one in the 5th c. restoration. Digging continues. We are again short of people, as we had no volunteers today. There are so many jobs to do and so few people to do them. Helen Harrington is doing a great job managing finds, whilst Andy Bates and Diana Everett drew the first wall section today. Kelly Madigan and Angela Gillen are trying to finish drawing the façade, but work is easily disrupted by emergency tasks requested by the diggers, who are trying to finish cleaning two large areas. 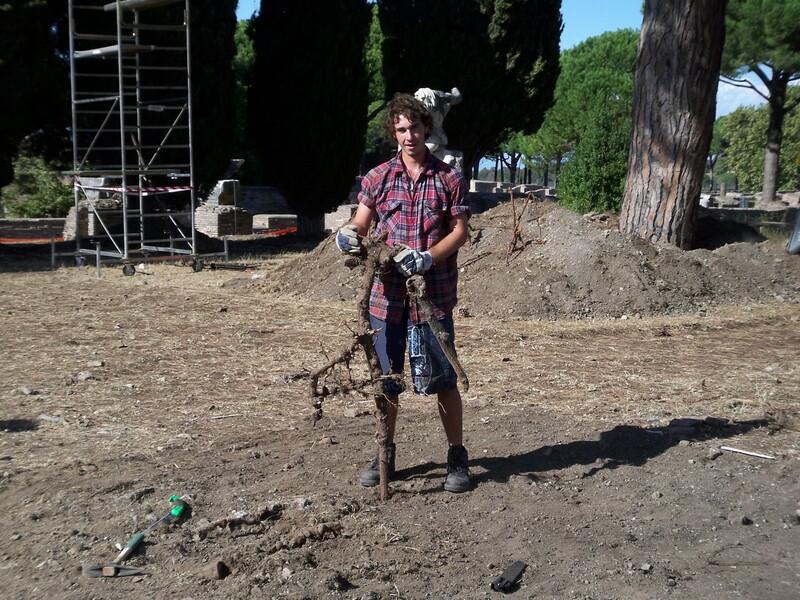 The arrival of a root cutter, lent by the sopraintendenza, made this work easier, as previously we had struggled to dig round them, and they had even broken our tools. This is perhaps the revenge of the trees, though there has been no ‘Attack of the Ents’ so far. Alex continues to chop through them, making excavation much easier. Work intensifies – on final digging, drawing, washing, labelling – as does growing angst – about where on earth are we going to store all our equipment over the winter. Posting it all back to Canterbury does not seem the best idea given our adventures with DHL.